Baron needs a new food. He is so picky that he suddenly quits eating his food before you can finish a bag. His parents want it to be safe & healthy, yummy, and made in the USA. I went searching for a pawsome food for Baron because I know more about dog food than he does. He wants both a dry food and a wet food. Luckily my pals at Merrick were able to help me out. 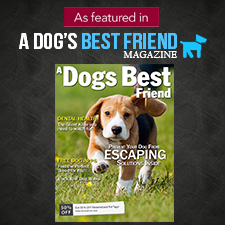 They make both wet and dry dog food that have the quality we're looking for. Merrick explains their commitment to safety and quality with their Merrick Five Star Promises. Merrick is made in the USA with locally grown ingredients. None of the ingredients are from China. Since Merrick's foods are made in their own kitchen, Baron won't need to worry about cross-contamination from a shared facility. Merrick is the first pet food company to have achieved SQF level 3 certification. Level 3 is the best SQF certification available. SQF levels are certified by the Safe Quality Food Institute. Baron is one of those dogs who gets allergy itches, so we asked Merrick for the Grain Free Real Lamb & Sweet Potato dry food. Baron likes wet food mixed with his dry food, and he wants the big chunks broken into smaller bites. Did I mention that Baron is picky? We mixed some Merrick Chunky Big Texas Steak Tips Dinner canned food with the Merrick Grain Free Real Lamb & Sweet Potato dry food. Merrick Chunky Big Texas Steak Tips Dinner ingredients: Deboned Beef, Beef Broth, Beef Liver, Dried Peas, Natural Flavor, Dried Potatoes, Calcium Carbonate, Canola Oil, Potassium Chloride, Salt, Sodium Phosphate, Dried Celery, Vitamins (Vitamin E Supplement, Vitamin B12 Supplement, d-Calcium Pantothenate, Vitamin A Supplement, Niacin, Vitamin D3 Supplement, Riboflavin Supplement, Pyridoxine Hydrochloride, Folic Acid, Biotin, Thiamine Mononitrate), Guar Gum, Choline Chloride, Minerals (Zinc Amino Acid Complex, Iron Amino Acid Complex, Manganese Amino Acid Complex, Copper Amino Acid Complex, Potassium Iodide, Cobalt Glucoheptonate, Sodium Selenite), Caramel Color, Cumin, Cinnamon, Garlic. Of course Mom just had to read the ingredients to be sure there weren't any weird things in the food - there aren't any. Now that I've found a food with the qualities Baron's family wants, let's see if it passes the taste test. I helped test the Chunky Big Texas Steak Tips Dinner. Baron may prefer smaller bites, but I say bigger is better. BOL! Merrick is right, you can eat their chunky food with a fork! This piece is so big I have to open real wide to fit it in my mouth. BOL! Mom didn't use a spoon at all, not even for the gravy, just my fork. After Mom finished feeding me with the fork, I licked up the gravy in my bowl. Baron is too nervous to eat near me because I am greedy about food. You know everything belongs to me, right? Baron happily ate his Merrick dinner inside the safety of his crate. Taste test passed! Baron is now a Merrick dog. Let's not forget desert! These yummy Kitchen Bites Wingalings biscuits are just the thing to finish up a delicious Merrick meal. Kitchen Bites - Wingalings Applewood Bacon ingredients: Deboned Chicken, Sweet Potatoes, Potatoes, Peas, Organic Cane Molasses, Chicken Fat, Carrots, Apples, Flaxseed, Applewood Bacon Flavor, Gelatin, Mixed Tocopherols (a preservative), Rosemary, Sage, Thyme. I know there is more in that big Merrick box, c'mon Mom, let me see what else is in there. These aren't Merrick, they are Organix, but they're in my Merrick box. Hmm... This is a mystery. Mystery solved: Organix is a Castor & Pollux brand. Castor & Pollux is part of the Merrick corporation. Organix products are organic, all natural, and made in the USA. Oatmeal & Beef Ingredients: Organic Oatmeal, Beef, Organic Barley, Organic Brown Rice, Organic Oat Flour, Organic Peas, Organic Cane Molasses, Organic Apples, Organic Carrots, Olive Oil, Organic Caramel Color, Gelatin, Mixed Tocopherols (a preservative). Oatmeal & Lamb Ingredients: Organic Oatmeal, Organic Barley, Organic Brown Rice, Organic Oat Flour, Organic Peas, Lamb, Beef, Organic Cane Molasses, Organic Apples, Organic Carrots, Olive Oil, Organic Caramel Color, Gelatin, Mixed Tocopherols (a preservative). Organix Jerky Chip Cookies are delicious. These oatmeal cookies have chips of meat in them! They are easy to break into small pieces for Baron, or to use as training treats. Naturally, I want the whole cookie, or 2, or 3, or 4.... BOL! Woo! Hoo! I got 2 whole cookies! One was Oatmeal & Beef, and the other one was Oatmeal & Lamb. Yum, this was a delicious day! After eating all of those Merrick goodies, it's time to clean my teeth. Wait a minute, there's more in the box! Merrick included 2 bags of dental chews. I have Lil' Brush Dental Bones and Dental Texas Toothpicks! Let me chew one of each, you know I like to be thorough in my taste testing. Merrick Dental ingredients: Potato Starch, Vegetable Glycerin, Dried Plain Beet Pulp, Cane Molasses, Chicken Fat, Natural Chicken Flavor, Water, Alfalfa Nutrient Concentrate (source of chlorophyll), Lecithin, Dried Cultured Skim Milk, Parsley. Giveaway Disclosure: I did not receive any compensation for this giveaway. Merrick will ship the prize directly to the winner of the giveaway. I am not responsible for lost/missing prizes. The opinions in this giveaway are my own and not influenced by any outsider. Oh wow that all looks so delicious! 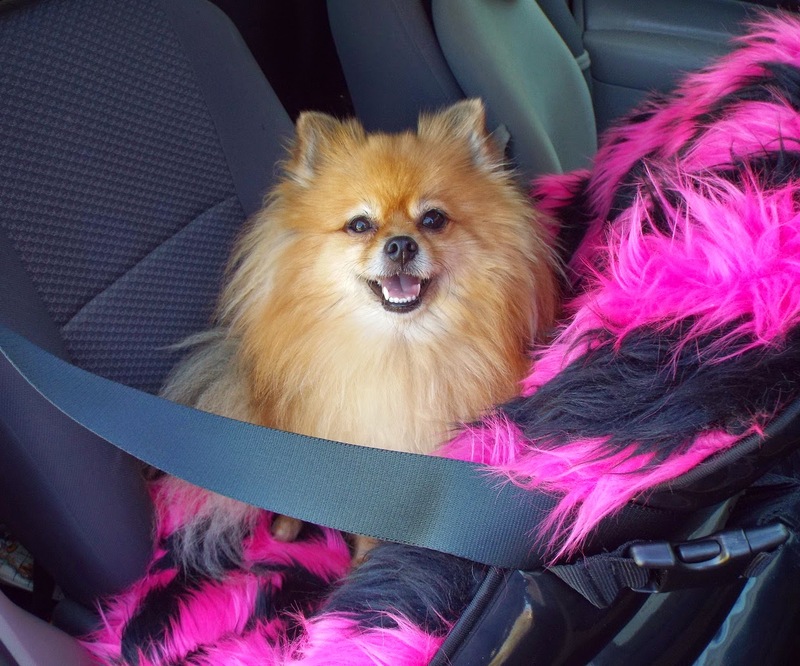 You are one lucky Pom, Pepper! My mom used to have the groceries delivered twice a month. But now I'm 14 years old & have developed inflammatory bowel disease. One thing nobody tells you is that it also takes your sense of smell. Now I send mom to the store, in person, almost every single day. I keep her guessing....if she brings home something I like, she runs right back out to buy it all up. So, of course, I can't keep eating that. So then she runs back out to the store to find something for me to eat that I haven't tried yet. This is loads of fun.....but she looks terrible. We just passed the 6 month mark, and I finally see her getting gray hairs. This is great! 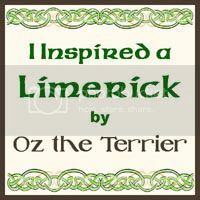 Even though we bark and growl at each other, at least we can agree that Merrick makes awesome stuff! My sisters and I love them! for some reason our dog has issues with grain. our vet said it's very common. I have five rescued Treeing Walker Coonhounds who will eat just about anything you give them. However, as their mom I am working on making sure they are getting healthy food without things they don't need, like corn and wheat and other fillers. Suki is 13 and needs a food that is gentle on her senior system. Ran, Kenji, and Seiji are all around 4 years old - active, healthy, and healthy weight. Kyoko is five and had almost been starved to death before being dumped at the kill shelter I adopted her from. She is no longer emaciated, and in fact has gotten TOO chubby and now I'm working on getting her to lose some weight. 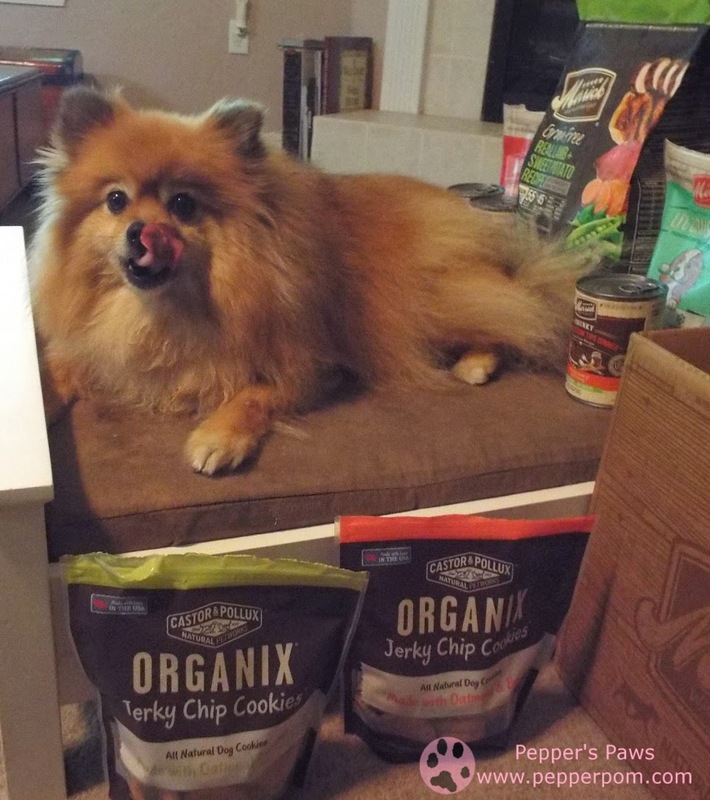 We like the Organix Jerky Chip cookies too! Haven't tried any of the other merrick products yet but would love to! We have tried the Organix Jerky Chip cookies but nothing else- would love to give more Merrick products a try! Oh, I loves me the Merrick stuffs!!! I don't eat their foods (cause I gets my kibbles from the vettie) butts I do loves their treaties!! 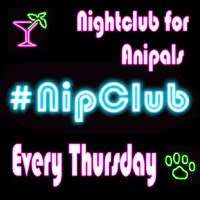 Top notch fursure!!! Since this is also a food giveaway, I thinks I'm gonna let some other lucky doggie gets the chance to win the most FABulous prize box!! 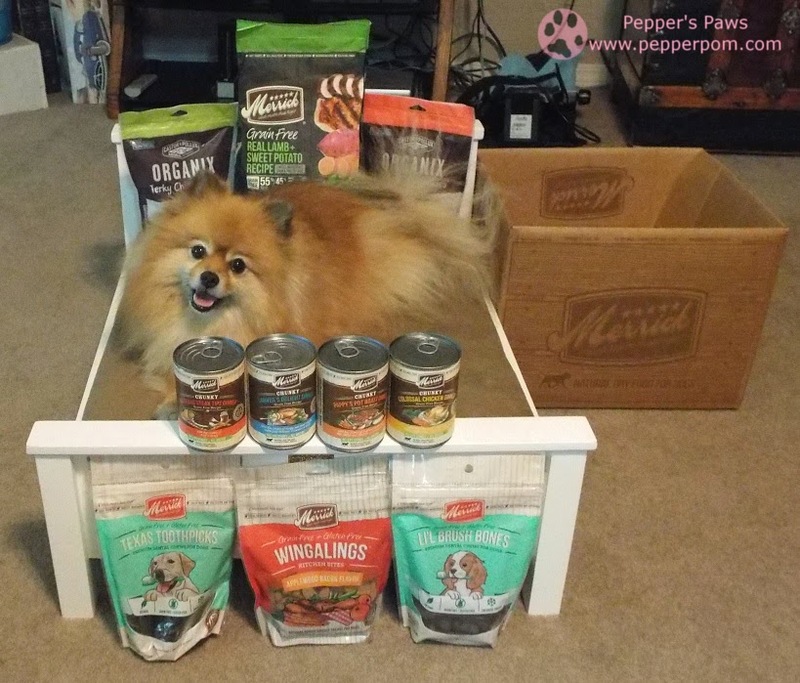 You do the bestest reviews Pepper! And it sure looks like you loved the goodies!! My Stella is not a picky eater but I am very picky about what I feed here...we are grain free and would love to try Merrick's grain free food. Picky eater?! Yup, that's me! Only the best for this Princess! I do have a dog with allergies, and I think this food would be perfect for my parents' dog, Sully. 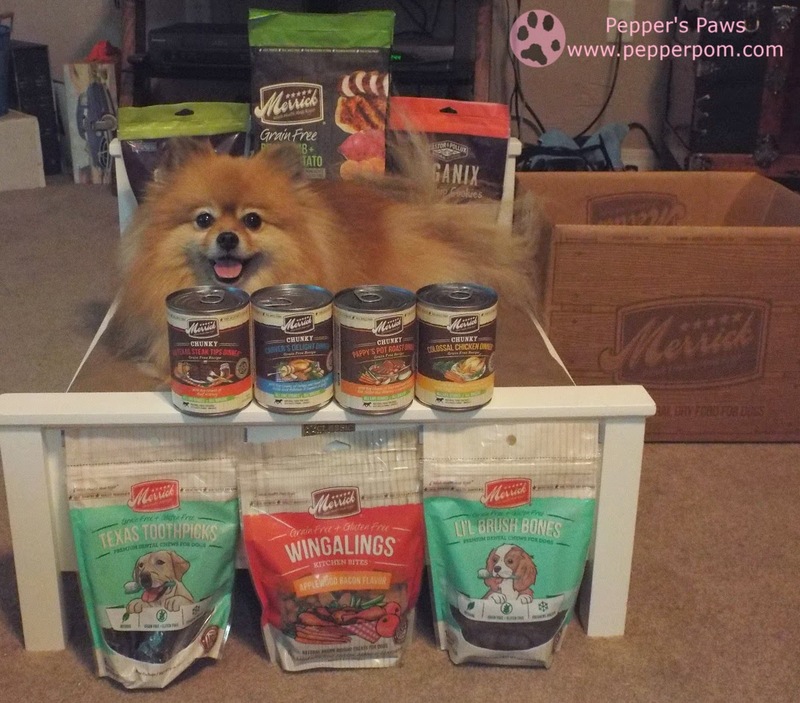 Pawsome giveaway Pepper! Shiner just tried Merrick recently and we love it. She loves their Flossies. And no she is not a picky eater! not a picky eater at all!! We LOVE Merrick and Jozi's favorite is the grain free food....she is dieting so does not get many treats and mom has not bought any of the Merrick treats yet but she'd be willing to let Jozi try some if we won. Thanks so much for offering such a HUGE and AWESOME giveaway! 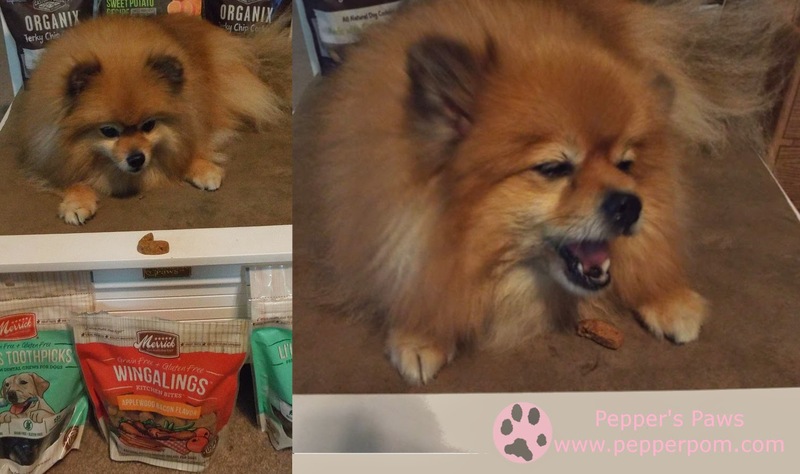 Jozi LOVES Merrick but is on a diet so only gets the grain free chicken and sweet potato recipe but she would love to try some of the treats if we had the opportunity to win such an AWESOME giveaway! One of my dogs is a picky eater. The other one loves it all!!! Would like to try this food to see if the picky eater would like it. Kaylee is not a picky eater and doesn't have allergies (to our knowledge) but she has been showing some skin sensitivity that we are trying to narrow down which might be allergies or food related! 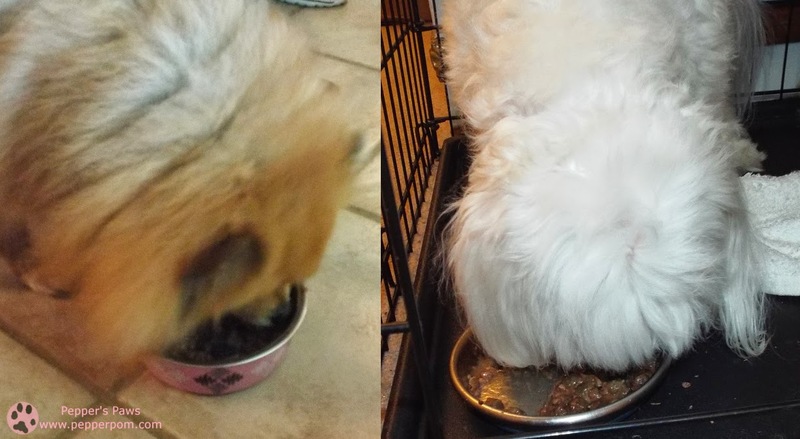 Some of my foster dogs are picky eaters, but Merrick's always wins them over! Would love to try those treats! We love Merricks food! 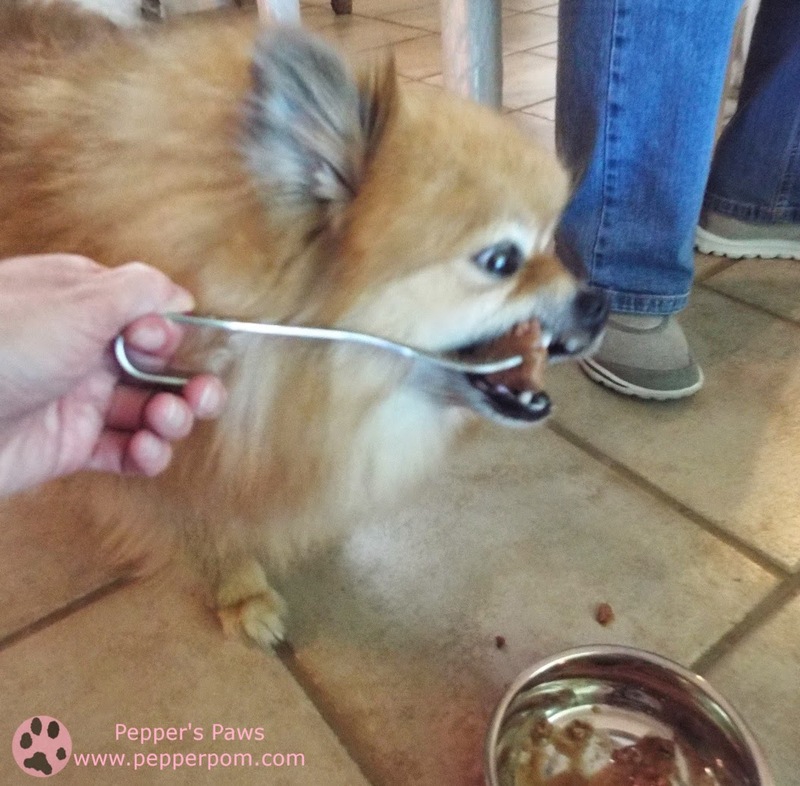 So not picky eaters, not sure what my face merrick food is because us furbabies havent tried it yet! We love Merrick, and we would love to try the new flavors of the grain free food. Any idea when those will start hitting stores? We can be picky, we like seafood and chicken the best, no food allergies so far, whew!! Shyla is a very picky eater and she has beef allergies too. She hasn't tried Merrick's dry food but I think she would do well on the Classic Adult Toy & Small Breed Real Chicken with Brown Rice & Green Pea formula. Shyla eats the Grain Free 96% Real cans and just loves them! My English Mastiff, Jasmine can be very picky when it comes to her food. At dinner, she has to have her dry food mixed with a little bit of wet food. She is very spoiled. No allergies and we haven't tried Merrick foods yet. No picky eaters here,they eat everything! We haven't tried this food yet. I will eat ANYTHING my Mom gives me! Not picky and no allergies. I love the Brown Rice & Green Pea formula most!